Only one day to wait now for the new Jason Isbell and the 400 Unit album and in order to whet your appetite RS Country have published an extensive track by track guide to it with clips thrown in for the songs we know already: “It’s been five years since Jason Isbell left Alabama and moved to Nashville, still reeling from the wilder, wetter days that had nearly derailed his solo career. Clean and clear-eyed for the first time in years, he moved into a townhouse with Amanda Shires. There, not far from the north shore of Percy Priest Lake, he wrote Southeastern, an album that would mark his official transformation from bar-band cult hero to Americana kingpin. Half a decade later, The Nashville Sound finds a recharged Isbell waving the flag for his adopted hometown’s left-of-center roots musicians. The city has changed markedly since his arrival, with exports like Isbell, Sturgill Simpson and Margo Price challenging the public’s perception of what Nashville – a town whose very name remains synonymous with mainstream country music – actually sounds like. His roots sunk deep into Tennessee ground, Isbell digs in for his biggest, boldest album to date, one that skirts the tired trends of Top 40 twang and, instead, sets a new watermark for accessible, articulate Americana. Once again, the songs were written at home – this time in a modest place somewhere south of the city limits – with Shires pulling triple duty as muse, editor and bandmate. Also contributing to the album’s pointed punch are the 400 Unit’s Sadler Vaden, Chad Gamble, Derry DeBorja and Jimbo Hart, all of them whittled into sharp shape after touring in support of Southeastern and its chart-topping follow-up, Something More Than Free. For the first time since 2011’s Here We Rest, Isbell’s backing band receives co-billing on the album – a move that’s well-deserved. Influenced by everything from America’s cultural divide to Isbell’s toddler-aged daughter, The Nashville Sound isn’t just the story of a city. It’s the story of a country and the characters within it, from the homesick southerner who haunts the city streets in “The Last of my Kind” to the level-headed peacekeeper who urges tolerance in “Hope the High Road.” Some of those characters sound an awful lot like Isbell himself. Many of them don’t. They’re all compelling, though, breathing humanity and honesty into The Nashville Sound’s 10 songs. With The Nashville Sound hitting stores June 16th, we’ve broken down the album song-by-song – all of them written by Isbell, with Shires co-wrriting “Anxiety” – explaining the inner gears, guts and grit of Americana’s most-anticipated album of the year. Opening the album on a mellow note, “The Last of my Kind” spins the sad story of an Arkansas native who loses himself – geographically, emotionally, mentally – within the big city. “Nobody here can dance like me / Everybody clapping on the one and three,” Isbell laments during the initial 30 seconds, delivering the album’s first of many killer lines. Behind him, the 400 Unit fades in and out, waiting until the song’s second half to make a proper entrance. File this pissed-off rocker beside “Decoration Day” and “Go It Alone.” Recasting himself as a boozehound in an Appalachian coal-mining town, Isbell feels angry and spiteful, his horizons filled with mountains whose peaks have been blasted away in search of cheapening coal. He funnels that fury through distorted guitars and an epic chorus, nodding to his days with the Drive-By Truckers along the way. Isbell is on the move once again. This time, he’s driving back home, reeling from a bad breakup and a hard fall off the wagon. His plan? Finish the last of his “plastic cup of real good wine,” sober up and relocate to northern Mississippi, where “the summer is blistering, so there ain’t no one from here that’ll follow me there.” Punctuated by some swooning slide guitar, “Tupelo” is equal parts Southern soul and sad-eyed folk, the soundtrack for slow Sunday afternoons. Taking a hard look at his place in Trump’s America, Isbell tackles social privilege, gender politics and the desire to shield his daughter from the harsh realities of a country that remains divided along cultural lines. The anger is pointed and palpable here, hitting a high mark during the song’s solo section, where Isbell’s electric guitar and Amanda Shires’ fiddle chase each other in fuming circles. The Nashville Sound’s stunning standout, “If We Were Vampires” shatters the love song’s familiar mold, focusing not on the never-ending power of Isbell’s affection for Shires, but the pair’s limited time together. “This can’t go on forever / Likely one of us will have to spend some days alone,” the two sing during the song’s chorus, acknowledging their own mortality. The real gut punch arrives during the second verse, though, where Isbell’s voice briefly falters, a sign of an emotional recording session. A mid-tempo pop/rock song at its core, “Anxiety” is bookended by two sections of dramatic, guitar-driven crunch, like the musical manifestations of the unease that gives the song its name. On a track dominated by first-rate lyrics, it’s those instrumental breaks – particularly Sadler Vaden’s chromatic guitar riffs, which could’ve found a home on Tom Petty and the Heartbreaker’s Mojo – that steal the show. Caught halfway between Tom Petty’s poppy punch, Bruce Springsteen’s anthemic nostalgia and R.E.M.’s ringing guitars, “Molotov” takes a look backward, setting its scene “in the year of the tiger, 19something.” “I hope you still see fire inside of me,” Isbell sings to a former flame, seconds after rhyming “three wishes” with “being facetious.” Well played. “Chaos and Clothes” roots itself in the double-tracked vocals and fragile beauty of Elliott Smith’s bedroom recordings. It’s like nothing Isbell has ever made before, with soft, woozy textures replacing the bombast of the two songs that flank it. “You’re in the fight to the death, my friend,” he sings to the song’s narrator, a heartbroken single man struggling to forget the woman who’s left a trail of memories in his mind and the occasional garment in his apartment. 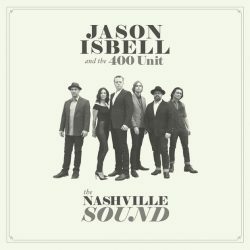 With a disappointing election behind them and an uncertain future on the horizon, Isbell and the 400 Unit mix politics with benevolence on this optimistic heartland rocker. “Wherever you are, I hope the high road leads you home again to a world you want to live in,” goes the final chorus, addressing the marginalized, the left out and the pissed-off. A close cousin to Something More Than Free opener “If It Takes a Lifetime,” “Something to Love” unfolds like a front-porch folk song, mixing coed harmonies with brushed percussion and understated guitar. Here, Isbell sings to his toddler daughter, willing her the resolve, patience and curiosity needed to survive in modern times. “I don’t quite recognize the world you’ll call home,” he admits, urging her to “find what makes you happy, girl, and do it ’til you’re gone.” That’s good advice.